The Amek 'G2520' is the analogue heart of The Base. Built and shipped to Australia in 1987, Phil purchased the console in 2004, and recapped and upgraded the entire board in 2016. It's dual path, in-line design features 40 mono channels with killer eq and filter sections, 8 stereo inputs, P&G analogue faders and the extensive routing capabilities only possible on dual path analogue console designs. The outboard in the control room leans heavily towards compression, a deliberate choice given the 40 great eq's and filters on the console. With 1176s, Distressors, Fatsos, LA4s, STA-Levels, 160As, SSL '500' series dynamics and buss comp, Rupert Neve Designs 535's, Giles Audio 1722, Drawmer 1960, Amek 9098 and a Smart Research C2, it's a great sounding, and always growing, collection. There is more than just compressors in the rack though, with BAE 1073s, Millennia pre's, Giles Audio valve pre's and Warm Audio Pultec-style eq's rounding out the options. The digital side of things revolves around the MacPro 'trashcan', with 32GB ram and 8 core 3GHz processor, 2 x HDX cards, a UAD Octo DSP card and a Quad expansion. Lynx 'Aurora' converters are on all the console ins and outs. Both Pro Tools "Ultimate" - previously known as HDX - and Logic Pro X are both installed on the machine and available for use, and the plugin list features UAD Ultimate, full bundles from Fabfilter and Soundtoys, Waves Diamond, McDSP, Native Instuments Komplete 11 Ultimate, AudioEase, Spectrasonics, Slate and many others. Monitor options include Focal SM9, Genelec 1029a, NS10m and Adam 10Sub, and the headphone system is a flexible 'audio over ethernet' design, sending 16 discreet channels to the live room and allowing artists to build their own custom headphone mixes. With an acoustic design courtesy of Peter Brown Architects and utilising a rear diffuser, bass traps, floating floors and all the expected features of professional studio design, the control room is a great sounding and very comfortable space for engineers and artists alike. The live room at The Base is an excellent room for almost anything. Drums, big - or little - guitars, solo or group vocals, strings, brass and full bands... the list goes on. The live space was also designed by Peter Brown, and it's wood floors, acoustic treatments and furnishings provide a natural and even sounding live space. Kept clean and free of clutter, it has a vibe that artists feel immediately comfortable in. A feature of the live space is the Yamaha C7 Grand Piano - at 7 feet, it's a big instrument with the sound to match. A Rhodes 88 MkI with suitcase amp and a Wurlitzer 200A round out the in-house keys in classic style. Additional instruments and amps include a Fender 'Deluxe Plus' Tele (1998), a MusicMan Silhouette Special, MusicMan StingRay 5 and a Martin D-15. A Marshall JTM60 and an Orange Tiny-Terror find their way onto a lot of recordings, along with a few pedals like the 'Flint' or 'Cali-76' for good measure. The mic cabinet holds the usual collection of greats - Neumann u87s, tlm49s, original - and unbeatable - u67, Royers, Schopes, AKGs, and Telefunkens. Alongside the prerequisite dynamics like RE20s, 421s, m88s, sm57, sm7Bs and even an old NS10 as a mic, there's plenty of choice. With Radial J48 DIs plus a mains powered monster DI stuffed full of tubes and transformers from Giles Audio, multiple midi controller keyboards and pads, re-amp boxes, adaptors and connectors, there's nothing the live room can't mic up or plug in. S2 is a beautifully equipped writing, recording and production suite. 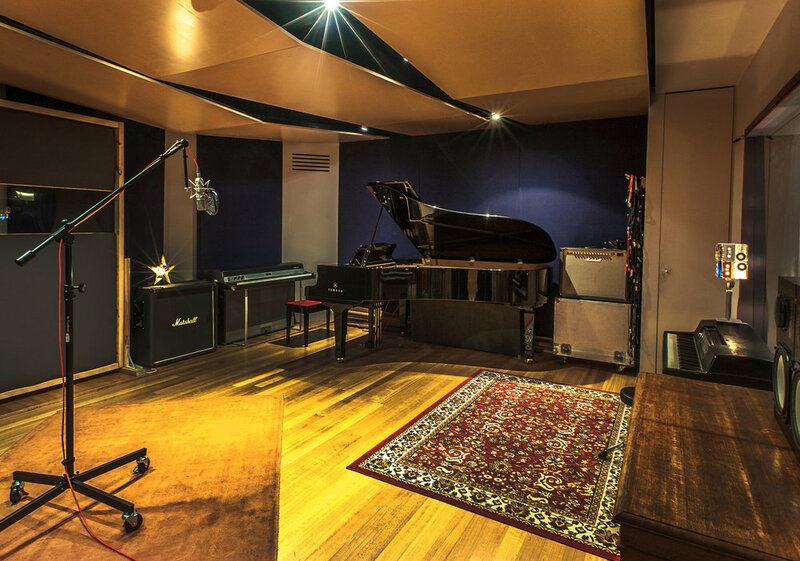 Located within The Base, this studio features an isolated vocal both and some great gear - like the UA Apollo Twin and Focal monitors - as well as having access to all the instruments, hardware and mics from Studio 1, making it an excellent option for artists or producers wanting a quality space for any project. S3 is the longtime personal recording, writing and production suite of critically acclaimed Australian music producer and songwriter Kaelyn Behr (aka Styalz Fuego). Kaelyn's accomplishments include the 2012 ARIA Producer of the Year, 2013 APRA Breakthrough Songwriter and 2016 APRA Most Played Australian Work awards and integral involvement in many multi-platinum, ARIA and APRA award winning projects across his career.